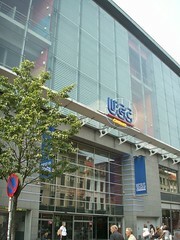 Located in the centre of Antwerp, close to Central Station. The 15-screen Gaumont was built on the site of the Cine Rex (1935-1993). The is one of 3-entrances to the Keyser Center which contains the cinema. This entrance is on Anneessensstraat. Since 2000, it has operated as the UGC.